Okay, let's be frank: Riedel "O" wine glasses aren't for everyone. If your sense of propriety demands a stemmed glass, we respect that. But for the rest of us, these stemless, lightweight wine tumblers are the perfect pick for casual sipping and dining, at home or alfresco. This special offer from Amazon.com offers you eight big "O" glasses for the price of six. Continuing our Wine Focus on offbeat grape varieties fit for the Wine Century Club this month, let's take a closer look at an immensely appealing and affordable white wine made from the Northwestern Italian grape Cortese. 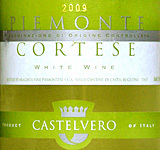 Castelvero 2009 Piemonte Cortese comes from Araldica, a larger corporate producer by Piemontese standards, making more than 10 million bottles annually under a broad portfolio of labels. But there's no hint of Olive Garden style in this Cortese, which offers considerable bang for the buck in a $10 (or less) bottle. Cortese is grown across much of Northern Italy, but its historic home for the past three centuries or more has been around the Alto Monferrato region in Piemonte. It is desired for its trait of retaining high acidity in the grape and wine, even in hot years, resulting in a crisp, snappy wine that goes well with fish but that may require a little winery magic (malolactic fermentation, for example, or even a little dash of concentrated sweet Muscat grape must) to hold it in balance. You may know Cortese as the anonymous grape that makes up 100 percent of Gavi, a popular Piemontese white. Here, however, it stands on its own in a delicious citric wine, full of grapefruit and lime, with lightweight alcohol and a rather rich body that keeps that acidity under control. Serve it cool on warm summer evenings and enjoy. Remember, we're featuring the diverse wine varieties of the Wine Century Club in Wine Focus for June in our WineLovers Discussion Group. Join us as our friendly international crowd of wine lovers share our thoughts, questions and tasting notes on the most off-the-beaten-path varietal wines we can find. FOOD MATCH: Versatile at the table, should be good with fish, poultry, pork or lightly spicy vegetarian fare like our choice, a Southeast Asian-flavor slaw dressed with white miso, peanut butter, Sriracha sauce and lime juice. VALUE: A very, very good buy for summertime sipping or table use at $10 or less. Watch for sales, as Wine-Searcher.com shows it widely available for less, occasionally as low as $7. WEB LINK: Araldica Castelvero has a fact sheet on the Cortese at this link. For additional assistance, this winery Web page offers an Email link for distributor information.